Held as part of X Media Lab's annual summit Global Media Ideas, Soundscape was a 3D audio demonstration created and hosted by Martyn Ware of Illustrious Company. Located within the iconic Sydney Opera House, Global Media Ideas was a two day event comprising a conference and a number of workshops exploring the cultural and commercial possibilities of new media. Performing to a packed conference of media and creative businesses and entrepeuners, Soundscape was a demonstration of the sonic architectural capabilities of the 3D AudioScape system. 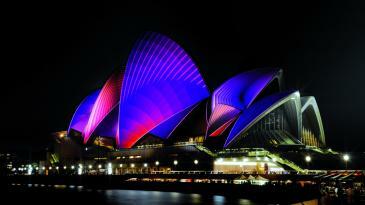 In partnership with New South Wales Government, ABC Television, Screen NSW, Sydney Opera House.